Mason has become very interested in the "bad guys" on Scooby Doo. He loves how the monsters are really just people dressed up (except for on the Scooby Doo 2 movie, those monsters are "real"). Today he decided it would be fun to dress up in all the different Halloween Costumes we have. He even convinced Nate to join in. Don't you just love those creative little minds at work! It's Frugal Friday again on Crystal's Blog. My frugal tip for the day is sharpening the blades of your garbage disposal. Put ice down the drain and turn on the disposal. What could be easier than that? If I have ice that has been sitting in my ice maker for a long time I like to do this. It gives me a chance to get rid of stale ice and sharpen the blades at the same time. Is your sink drain getting a little smelly? Pour a little vinegar down it to freshen it right up! Don't forget to check out other great tips here! We had an awesome 24th of July holiday. Steve had the day off so we headed to the local pond so the boys could fish. We had a lot of fun but didn't catch anything (thankfully, I hate to cook fish). I also was able to get 54 bottles of Vive shampoo and conditioner from Smiths for tax only and 20 Welpatches from Walmart for tax only. It was a great week shopping! So for all of you who don't have time to use coupons- get clipping! The only prices going up faster than food is personal hygiene supplies and cleaning supplies. For more Super Savings Saturday ideas go to moneysavingmom.com Crystal always has such great ideas to share. 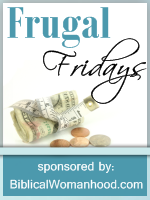 I love Frugal Fridays on Crystal's blog! It seems like everyone else's ideas are always so much better than mine that I never post. This week I have an awesome frugal and easy idea. Doughnuts. This recipe is from someone in my recipe club. Enjoy! This is super easy and inexpensive. For more frugal ideas go to biblicalwomanhood.com and check out Frugal Fridays. Wow! It's been a long time since I've posted anything. Sometimes life just gets in the way doesn't it? We have been so busy lately that I haven't had time for much of anything. We've been wrapping up the kid's baseball games and have been having a lot of playdates. Steve still has 2 more softball games before he's done for the season. We spent the night tonight over at the church participating in a humanitarian project. It was a whole ward effort. We had dinner and got a lot done. I love teaching the boys about service. 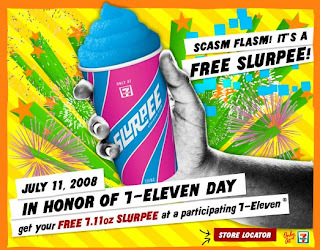 Today was free slurpee day at 7-11. If you went in they gave you a free 7.11 oz. slurpee. As we were driving there Nate asked, "what's a slurpee"? I felt kinda guilty- after all, I thought slurpees were part of a food group or something when I was growing up. Steve reminded me that are kids are quite familiar with "frosties" and 1/2 price slushes from Sonic. The boys are definitely not deprived. Today was also "Cow Appreciation Day" at Chick-fil-a. If you dressed up like a cow you could get a free combo meal. We were so going to do this. I thought maybe I had finally gone to far with what I would do to save a dollar but then realized that as long as it's honest and fun you can never go to far. I thought it would be a really fun memory for the kids too. What stopped us was that it would cost us quite a bit in gas to get to the nearest chick-fil-a thus defeating the purpose of the free food. Oh well, we stayed home with our slurpees instead. If you want to see some of the fun pictures from other peoples trips, head over to moneysavingmom.com and check it out. There are some really fun pics. Crystal's website is one of my very faves.